Cast off on a whimsical boat ride past a joyful congregation of singing children from around the globe. Sing along to the classic anthem of world peace during a musical boat tour hosted by the children of the world. Climb aboard a cozy boat and set sail along the Seven Seaways canal for an approximate 9-minute journey. Amid a vibrant backdrop exquisitely crafted out of papier-mâché, glitter and fabric, behold a cast of almost 300 traditionally dressed, dimple darlings from nearly every corner of the globe sing a simple song in their native language about universal harmony and dance. Travel to all 7 continents and, by journey’s end, see for yourself that it truly is a small world after all. Toward the end of the ride, the children reunite for a grand finale, reminding us of our common bonds of friendship, laughter and happiness—that we are all basically the same, especially when we see our world through child-like eyes. Written and composed by an Academy Award®-winning team of brothers, the song 'it's a small world' is a timeless classic. Composers Richard and Robert Sherman came to the conclusion that a single musical theme was the way to bring the song and attraction together, thus reinforcing the larger message of cultural unity and harmony. As you navigate the Seven Seaways, “it’s a small world” is lovingly sung by the children in their native languages—including English, Cantonese, Putonghua, Tagalog, Korean, Japanese, Italian, Spanish and Swedish. Originally, Walt Disney envisioned the world’s children singing the national anthem from each country they represented. But he quickly discovered that everyone singing a different tune resulted in a musical cacophony. Walt asked the Sherman brothers, who were hard at work on Mary Poppins, to create a singular song that could be sung by all of the children in their own language. The result was “it’s a small world”—one of the most well-known songs of all time. The Cantonese lyrics for “it’s a small world” were written by legendary Chinese lyricist James Wong more than 30 years ago; today, they are still lovingly sung by kids and adults throughout China and Hong Kong. Walt Disney selected Mary Blair as an art director and Alice Davis as the costumer to bring “it’s a small world” to life. With her distinctive use of color, geometric shapes and simple, child-like art style, Mary Blair was known for her visual aesthetic—felt in every aspect, in every nation, of “it’s a small world.” As you glide through the many scenes, colored paper in bold hues vividly create collages of some of the world’s most beloved countries, giving you the impression of sailing through a classic children’s book. Under the direction of designer Alice Davis (and her husband Marc Davis), Disney seamstresses gathered and sewed every inch of clothing to create a faithful portrayal of each nation’s traditional attire. That’s over 300 outfits in all! Authentic materials were used for each region, from silks for the saris of India to fine wool for the Scottish bagpiper. Don’t miss the attraction's kinetic exterior, complete with spinning flowers, icons of world landmarks and an animated clock tower. Every 15 minutes, watch the clock tower open up to showcase a multinational parade of 18 animated toy figures, including a Chinese opera singer that’s exclusive to Hong Kong Disneyland Park. Once the procession ends, 2 jesters herald the current time. 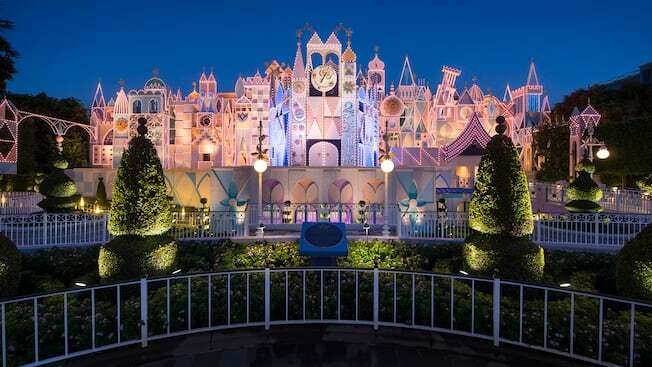 “it's a small world” debuted at the New York World's Fair in honor of the United Nations Children's Fund (UNICEF). Personally overseen by Walt Disney, the attraction was a huge hit for 2 seasons at the 1964-1965 fair and was eventually shipped back to Disneyland Park in California, where it reopened on May 28, 1966. Due to its immense popularity, the attraction has been replicated in every Disneyland-style park around the world—including Hong Kong Disneyland Park—and is considered a Walt Disney classic.